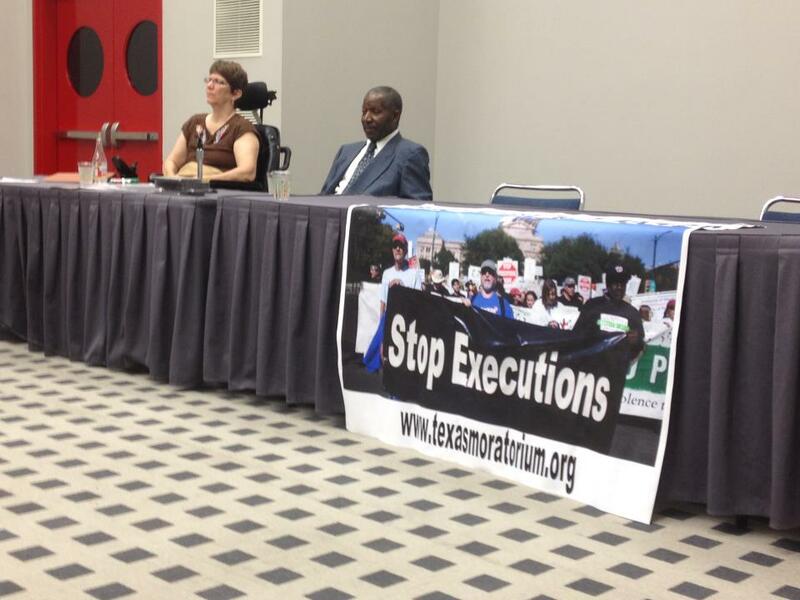 After 12 years of organizing and lobbying by ordinary grassroots Democrats across the state as well as by exonerated former death row inmates, the Texas Democratic Party has adopted a platform that calls for repealing the death penalty in Texas. 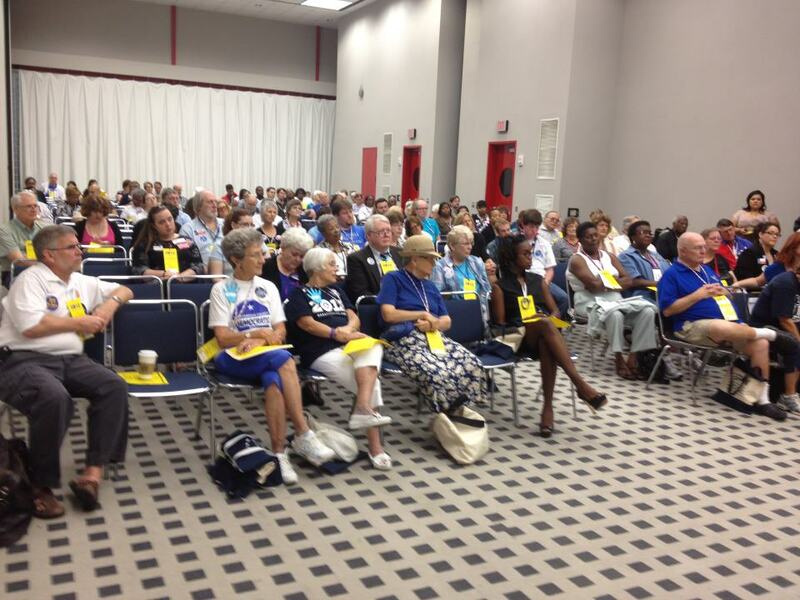 Thank you to all the Democrats across the state who worked so hard over the years for this moment to arrive and thank you especially to the delegates at the 2012 Texas Democratic Party State Convention for approving a platform calling for abolition of the death penalty! Thank you especially today to death row exoneree Clarence Brandley and to Elizabeth Gilbert (a friend of Todd Willingham) who both spoke at Friday’s packed caucus meeting of “Democrats Against the Death Penalty”. 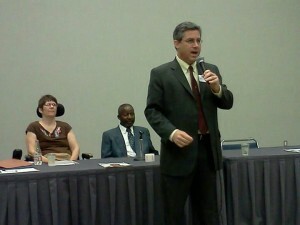 We urged everyone at the meeting to elect platform committee members who would vote yes for abolition. 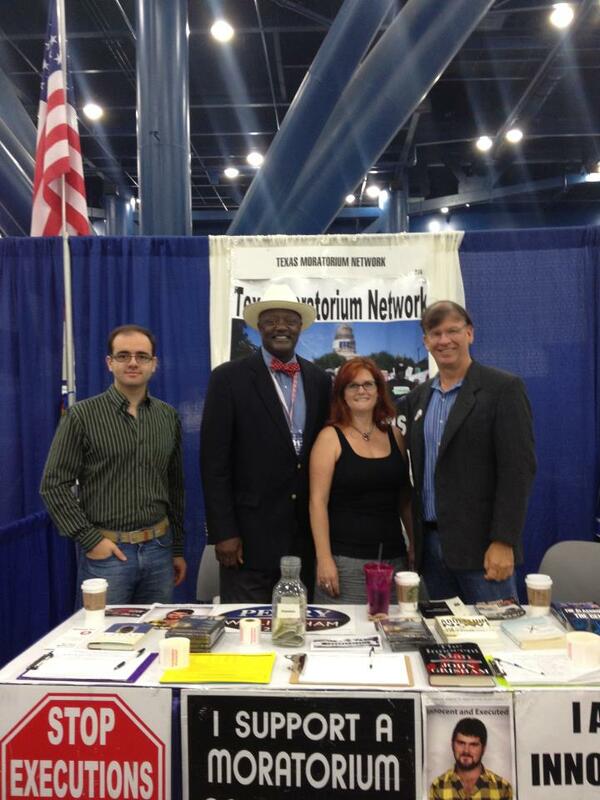 For the last 12 years Texas Moratorium Network has been urging the Texas Democratic Party to take a position against the death penalty and in favor of various criminal justice reforms that would improve the system, decrease wrongful convictions and eliminate the possibility of innocent people being executed. Starting in 2000, we have had a booth at every State Convention. In 2004, TMN developed the strategy of changing the platform through the Chair’s Advisory Committee on the Platform. In 2004, TMN’s Scott Cobb was on the chair’s advisory committee and elected to the permanent platform committee at the convention and wrote an entirely new section of the platform entitled “Capital Punishment” that for the first time ever included support for a stop to executions with a moratorium and a study commission. In 2004, members of TMN also for the first time organized a caucus within the party to push for abolishing the death penalty – “Democrats Against the Death Penalty”. We have held a meeting of the caucus at each State Convention since 2004, when we had a team of about 30 volunteers at the convention collecting signatures on a petition for a death penalty moratorium in order to bring a resolution to the floor of the convention for a vote. We collected signatures from more than 30 percent of the delegates which was enough to bring the resolution for a moratorium to the floor for a vote where it was approved overwhelmingly. In 2006, we went back to hold another caucus meeting. In 2008, more than 300 people attended the meeting at the State Convention of “Democrats Against the Death Penalty”. In 2008, many people worked very hard and succeeded in getting the Resolutions Committee to approve a resolution in favor of abolishing the death penalty, but the convention adjourned before the abolition resolution received a vote on the floor of the convention. In 2008, we proposed making further progress by adding language in favor of abolishing the death penalty at the Chair’s Advisory Committee on the Platform, but our proposal was rejected by the committee because the party was perceived to be not yet ready to take the position to end the death penalty. We met again at the 2010 convention in Corpus Christi when we brought death row exoneree Juan Melendez to speak to our caucus meeting and to the resolutions committee. Today, we just returned from another State Convention where we again had a booth and a caucus meeting with about 130 attendees in a packed room. Before the convention, we sent an email to about 5,000 delegates and alternates urging them to support repeal of the death penalty. And we succeeded. Texas Democrats are now on record in support of repealing the death penalty. 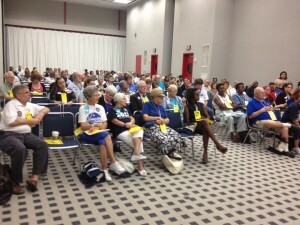 “Democrats Against the Death Penalty” met 10-11 AM Friday, June 8, 2012 at the Texas Democratic Party State Convention in Room 370 ABC at the George R. Brown Convention Center. Clarence Brandley, an innocent man who spent ten years on Texas death row for a crime he did not commit. Elizabeth Gilbert, who was a close friend of Todd Willingham, an innocent man executed by Texas. Elizabeth’s role in Todd’s fight to prove his innocence was told in the article in The New Yorker by David Grann “Trial by Fire”. Senator Rodney Ellis said in the most recent issue of Texas Monthly, “I’m convinced [Cameron Todd] Willingham was innocent”. We sold a bunch of DVDs at the convention of the award-winning documentary “Incendiary: The Willingham Case” by Austin filmmakers Steve Mims and Joe Bailey Jr.
Keith Hampton dropped by and introduced himself to the crowd. He is running against Sharon Keller for the position of Presiding Judge on the Texas Court of Criminal Appeals. She is the judge who said “we close at 5” and refused to stay open to allow lawyers for a person about to be executed to submit an appeal. 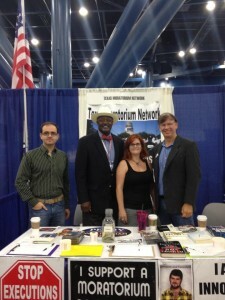 Former Texas Court of Criminal Appeals Court Judge Morris Overstreet visiting the TMN booth. Thank you to our volunteers at the booth, Jamie Bush, Scott Cobb, Hooman Hedayati, Gloria Rubac, Angie Agapetus, Lee Greenwood, Delia Perez Meyer and Joanne Gavin. Such amazing news! Well done for all the efforts that have gone into this. You are moving ever closer to ending this terrible state killing.